The new University Hospitals Ahuja Medical Center in Beachwood, Ohio, was designed not only to garner attention as a modern “signature” building in this upscale southeastern Cleveland suburb but to incorporate an innovative theory of “evidence-based” design in which scientific research was incorporated to better serve patients and promote healing in a guest-centered environment. The new $298-million 432,000 square-foot medical center – which includes both a seven-story 144-bed hospital and a three-story outpatient medical building – officially opened March 1, 2011. 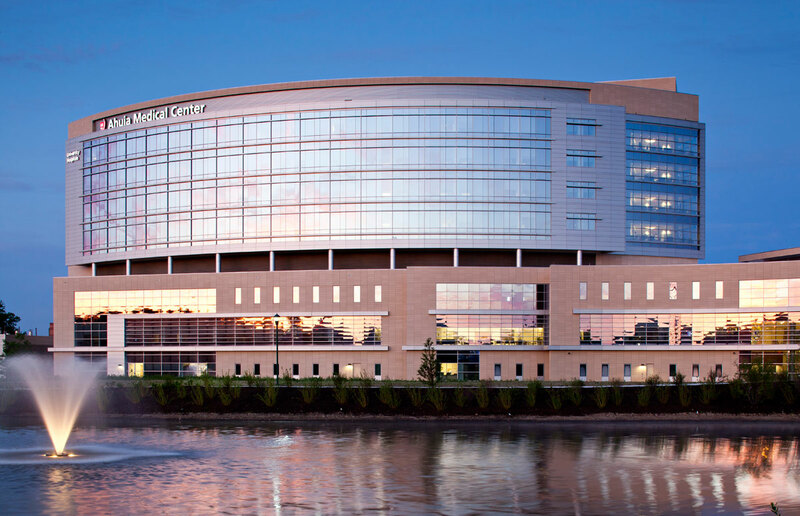 The hospital is designed with a seven-story curved curtain wall filled with glass and accent bands fabricated from Alucobond® aluminum composite material. 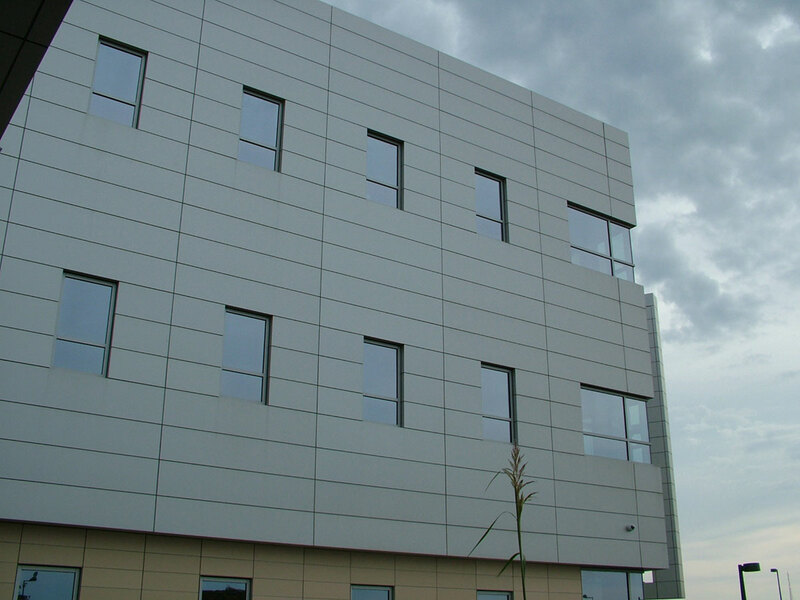 Alucobond also clads a large portion of the medical center’s exterior walls in combination with rain-screened terra cotta ceramic tile. Both interior and exterior columns and beams are covered in Alucobond ACM as well as are entryway canopies. This sweeping-curve design not only provides a visually striking exterior but makes the building interior easy to navigate, reducing foot traffic and improving patient sight lines to staff. Additionally, the curved design reduces wind and traffic noise from nearby Interstates 271 and 480 while offering panoramic views of the 53-acre park-like campus setting that includes protected wetlands. International architectural firm HKS, Inc., served as the project’s design architect in collaboration with Array Healthcare Facilities Solutions, Inc., which served as the corporate architect and interior designer. 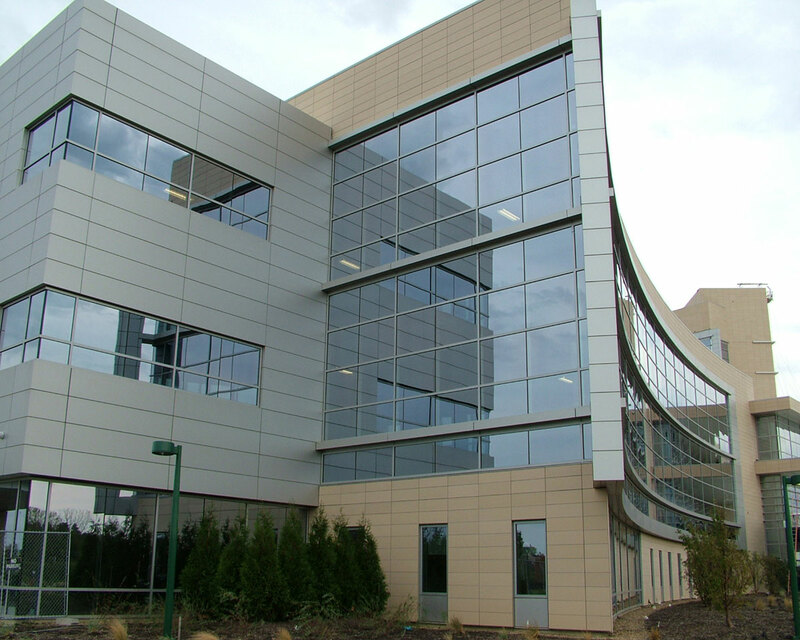 A total of 95,970 square feet of Alucobond PVDF-2 in the 4mm thickness and custom Ahuja Crystal color was fabricated for the medical center by Royalton Architectural Fabrication, Inc., of North Royalton, Ohio. The Alucobond was installed with Royalton’s Royaltech 200A wet-seal panel system by Carroll Glass Co., of Euclid, Ohio. The Cleveland office of Gilbane Building Co. served as construction manager on this project. Wall panels were field measured and fabricated by elevation as the buildings were being constructed, according to Winkler, who said the Alucobond performed well in the Royalton composite panel system, which incorporates stiffeners. Architects at HKS spent a great deal of time determining the types of building materials required to create a modern and environmentally-friendly design for the medical center, according to Meltzer. The hospital is expected to expand through the years to 600 beds with the new seven-story tower serving as the first of three planned towers, according to Meltzer. At the outset of planning for the Ahuja Medical Center, University Hospitals expressed interest in incorporating green building methods and materials. 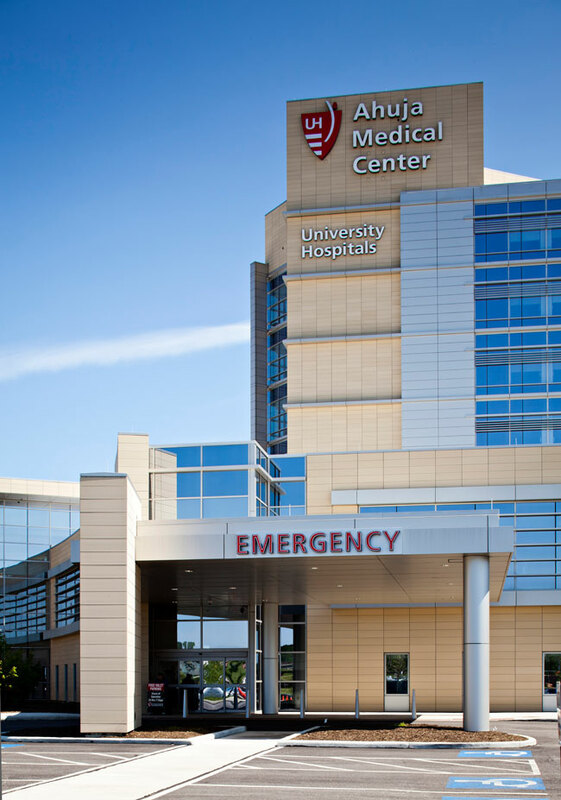 But it wasn’t until the project already was underway that hospital executives requested that it be submitted for green building certification through the U.S. Green Building Council’s Leadership in Energy and Environmental Design (LEED) program. University Hospital Ahuja Medical Center was awarded a LEED New Construction 1099 (NCv2009) Silver certification – giving it the distinction of being the first healthcare facility in the United States to receive certification under this version of higher and more stringent sustainable requirements. Among the many green building methods incorporated in the medical center are: the use of bio-swales and bio-retention basins to manage onsite storm water, a plan to reduce energy through metering and monitoring, installation of photovoltaic panels on the roof, and the selection of sustainable and eco-friendly materials to provide a healthy indoor environment. The completed medical center has been well-received, according to Meltzer.